There are three lines of wines produced at Escarpment. The Edge is aimed at younger drinkers and those who prefer buying wine by the glass. These blended wines (currently Pinot Noir and Pinot Gris) are made from various vineyards or districts in New Zealand and became available with the 2008 vintage in the States. 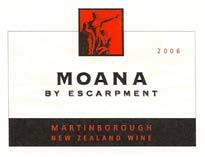 The Escarpment wines are premium district blends exclusively from Martinborough. These wines include classic varieties such as Pinot Noir, Chardonnay, Pinot Gris, Riesling, Pinot Blanc and Viognier. The Single Vineyard Wines are the supreme expression of Larry McKenna’s winemaking skills. They are a limited range of red and white single vineyard wines christened “Martinborough Insight Series.” Beginning with the 2006 vintage, three new sites in Martinborough were added to the estate Kupe Vineyard on Te Muna Road. These wines allow for individual vineyard expression from distinctive sites utilizing some of the oldest vines in the district. 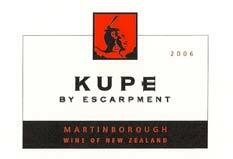 In addition to the Kupe estate vineyard, there are bottlings from Kiwa Vineyard (clones UCD 5,6 and 13 planted on Gill Cleland’s Vineyard in 1989), Te Rehua (several clones grown on the Barton Vineyard from vines over 20 years old), and Pahi (grown on the McCreanor Vineyard, one of the oldest vineyards in the district - clone 10/5 on its own roots). Larry's wines are not bashful. Instead they strut lush fruit and rich flavors. Despite their intensity, they have nice harmony and are not nearly as extracted as many popular California Pinot Noirs. Escarpment wines are imported to the United States by Empson USA, Inc., Alexandria, VA (www.empsonusa.com). 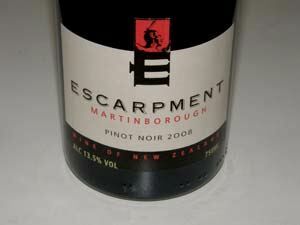 The Escarpment and Kupe Pinot Noirs are most available and represent quintessential examples of Martinborough Pinot Noir.